California Chief Justice Tani Cantil-Sakauye personally presents Awards of Excellence to schools honored for their civic education programs. More than 50 California public elementary, middle, and high schools are being recognized with this year’s Civic Learning Awards. 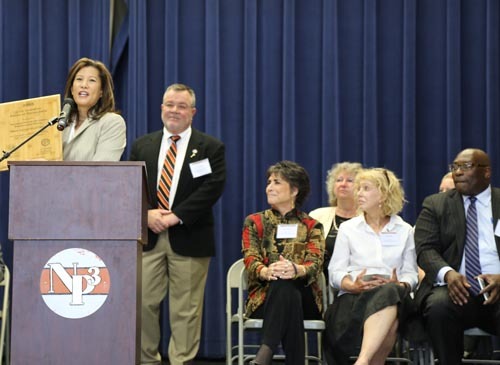 Co-sponsored by Chief Justice Tani Cantil-Sakauye and State Superintendent of Public Instruction Tom Torlakson, the awards celebrate public schools’ efforts to engage K-12 students in civic learning and identify models that can be replicated in other schools. In addition, 47 schools received Awards of Merit. Launched at the 2013 Civic Learning Summit, the awards program is part of the Chief Justice’s civic learning initiative and partnership with the State Superintendent of Public Instruction.